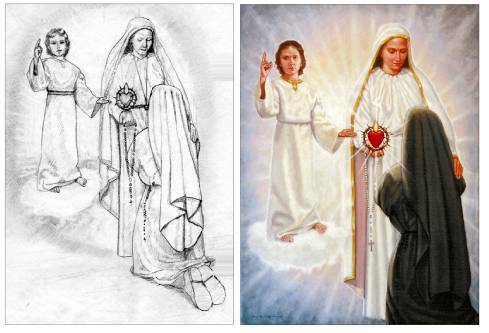 The Virgin Mary appearing to Sister Lucia with the child Jesus by her side. As you can see, some changes were made to the final painting when compared to the sketch. This is because the final size of the painted image that was going to be used. The magazines art director and I decided it would be helpful to crop in tighter on the important elements of the painting. We also decided to intensify the background to better help tell the story. This shows how we can manipulate the sketch to better fit the actual surroundings of the painting.